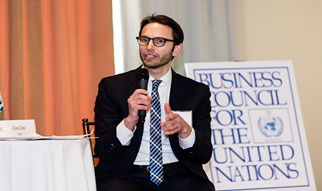 Last week, the Business Council for the United Nations hosted “Health in Post-2015: More Present, More Integral, More Influential”. The luncheon provided an occasion to assess the enormous opportunity that lies ahead and to reflect on how to achieve a meaningful, integrated implementation of the Sustainable Development Goals (SDGs). At the luncheon, a paper and infographic that was developed by Pfizer and GSK, and focused on the central role of health in the post-2015 sustainable development agenda, was presented.